Cows, chickens, goats – animals are an inseparable part of our everyday farm life. Especially the Brodowin cows have a very special position with us, because for more than 25 years they give us their milk daily and are a vital part of our bio-dynamic closed-loop economy. They are the basis for our regional milk manufacturing and are rightly the main feature of our brand logo. It is our self-imposed duty to respect the existence of each animal and to value it from the day of its birth. This respect will also be maintained when the decision is made to slaughter a dairy cow. At this point we would like to give you an insight into a part of our everyday life at the farm. We are convinced that only a transparent way of working can create trust and open questions have to be answered honestly and entirely. A cow from Brodowin spends her whole life on our farm. About every week a calf sees the light of day and grows into a dairy cow within 27-29 months. As part of the herd, the animal spends its daily life in the stable and on the pasture, is milked daily and receives one calf every year. 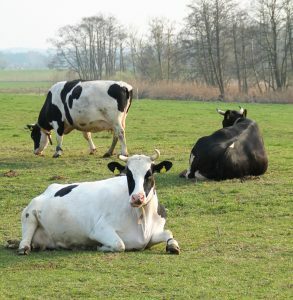 Approximately 50 dairy cows live in a herd; they share an area in the stable and on the pasture, the feed and the potions. Weight, size and age are decisive for a fixed ranking, the order of which is also regulated by the use of the horns – the pure demonstration of headdress is usually enough. What many people do not even know: both female and male cattle carry horns. And they can keep them in Brodowin, too. Our Brodowin dairy cows produce an average of 20 – 25 litres of milk per day, the individual development of the milk quantity is recorded electronically. In addition, the “direct animal recognition” by the herd leader is indispensable – in Brodowin, the team in the cowshed knows their animals exactly and can react quickly to behavioural changes in this way. Conspicuous deviations from one day to the next usually indicate a disease in which a veterinarian is consulted. However, a permanent and constant decrease in milk yield over several lactation periods (time between calving and drought in pregnancy) is normal. If the milk quantity of a cow reaches a permanently low level or if it repeatedly does not become pregnant, we decide at some point to slaughter the animal. At this time a cow is usually between 6 and 12 years old. It goes without saying that this decision is not taken lightly. Nor are we indifferent to the circumstances of slaughter. On the day of slaughtering, a cow is driven to the local slaughterhouse in Lunow, only 7 km away. 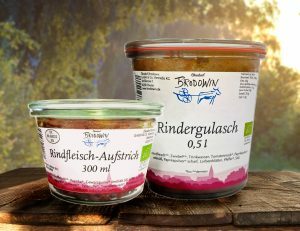 The organic-certified Künkel Landfleischerei takes care of both slaughtering and cutting. Our claim to complete recycling is taken seriously here. The meat is returned to us, and the horns are also partly needed for the production of our bio-dynamic preparations. Animal skins enter the tannery, hooves are processed into fertiliser. From the marrow bones we cook broth and even “unpopular” parts such as tongue, heart or rumen are processed into dishes in our kitchen in Eberswalde. In accordance with our philosophy in the handling of food, we would like to counteract the trend of wasting resources. Since only one cattle is slaughtered per week, production is limited accordingly. Many dishes are therefore prepared daily fresh in small quantities and are only available at the delivery service or in the farm shop – while stocks last. In 2001, about 10 years after the foundation of our Demeter farm, the first Brodowin salami was produced. Finally we didn’t have to sell our dairy cows any more and saved them from long transport journeys. 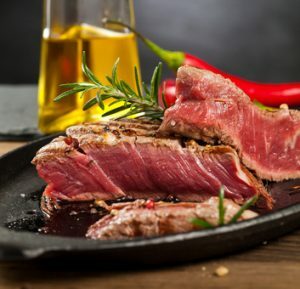 At that time, all the meat was processed into just one product – the costs of processing were barely covered by the sales price. The production is still carried out by the Eberswalder Wurst-Werke. We are now looking more closely. We offer our customers high-quality pieces directly, a piece of fillet, for example, no longer gets into the sausage. Our chef also tries specialities. Rumen is processed into, for example, sour tripe, a beef heart is prepared in a fine red wine sauce and bottled in a 0.5 litre jar. And also classical dishes such as beef goulash or stew can be found in our assortment. We deliver Brodowiner beef products directly to your home – with the Brodowiner delivery service. Visit our online shop and support our daily work with your purchase. If you have any further questions about the farm, the animals or bio-dynamic agriculture in general, please do not hesitate to contact us at info@brodowin.de Or you can book a guided tour around our farm, through the stables and along the glass dairy. You can find more information HERE.